More than 150 years ago, Massachusetts became the first state to provide all of its citizens access to a free public education. Over the next 66 years, every other state made the same guarantee. The result was a publicly-funded system where, in every American classroom, groups of about 28 students of roughly the same age are taught by one teacher, usually in an 800 square-foot room. This model has been the dominant archetype ever since. It's a factory-model classroom. Inspired in part by the approach Horace Mann saw in Prussia in 1843, it seemed to adequately prepare American youth for the 20th century industrialized economy. But in 1983, the federal government declared in A Nation At Risk that our system was starting to slide. The year 1983 was also seminal for the technology industry. Microsoft released MS Word and Apple introduced the new Apple IIe. Some predicted that the demand for better schools, coupled with the supply of computers and new software, would soon revolutionize our nation's classrooms. Schools did move to adopt new technologies - computers and software, increased bandwidth, and infrastructure. But there is scant research-based evidence that these tools have had the exponential impact on public education many anticipated. Given the enormous impact that technology has had on nearly every other aspect of our society, how can that be? Perhaps it is because educational tools that have come into our classrooms over the last couple of decades, whether technology or otherwise, continue to be used within a school structure that is virtually unchanged since the mid-nineteenth century. That model was imported from Prussia with a different purpose in mind. Horace Mann's free school movement stemmed less from a belief in the economic or moral imperative of education for all children and more from a desire to simply create a tolerant, civilized society. Mann grew up in Massachusetts during the early part of the 19th century, where religious tension between Protestants and Catholics dominated public life. Parochial schools, in his view, only reinforced these divisions. The Prussian model, on the other hand, was designed to build a common sense of national identity. Applied back home, Mann thought, large groups of students learning together would help to blur the divisions among religious groups and establish a more unified and egalitarian society. And as that model became the American blueprint, Mann's vision ultimately became the foundation for our national system of schooling. Mann's vision also made sense for the industrial age in which he lived. The factory line was simply the most efficient way to scale production in general, and the analog factory-model classroom was the most sensible way to rapidly scale a system of schools. Factories weren't designed to support personalization. Neither were schools. Today our collective vision for education is broader, our nation is more complex and diverse, and our technical capabilities are more powerful. But we continue to assume the factory-model classroom and its rigid bell schedules, credit requirements, age-based grade levels, and physical specifications when we talk about school reform. That's why the promise of educational innovation is less about processing power and software code and more about the opportunity to release ourselves from general assumptions regarding how instruction is organized and delivered. It's why our collective charge in K-12 innovation today should go beyond merely designing and producing new tools. Rather, our focus should primarily be to design new classroom models that take advantage of what these tools can do. Absent new models, many of our technological capabilities (which can now support both scale and personalization) are either inaccessible or clumsily grafted on. Three computers added to the back of a classroom may look like a positive step toward bringing that classroom into the advanced technological age. However, smoothly integrating three computers into a daily lesson is not always easy when a teacher has to consider the needs of 28 students all learning at the same time. Software programs that enable students to learn at their own pace can be powerful, particularly for students who are at an academic level far above or below the rest of the class. But this type of software is often not readily compatible with a teacher's need to cover a grade-level scope-and-sequence for all students. Of course, some new technology tools have been useful in the classroom. There are many schools where interactive whiteboards have replaced chalkboards, computers support research in libraries, and electronic grade-books have supplanted spiral notebooks. These are the kinds of tools that can be readily integrated into a traditional classroom environment. But different teachers use these kinds of tools in different ways and their use does not facilitate a pivot from the rigidity of the factory model classroom. As a result, there is little research to show that investment in these kinds of tools has a meaningful impact on student learning. New classroom delivery models allow us to re-imagine new combinations of educator expertise, time, instructional materials, research, physical space, parental support, and (yes) technology in ways that achieve optimal outcomes for students. They begin not by assuming the current model but rather by understanding what it is we want students to be able to do, the measures of success, the resources we have to work with, and our own sense of possibility. Different schools may take different approaches to combining these components, depending on their educational philosophies, available teaching resources and student needs. For example, some might offer science through a combination of in-class activities, collaborative lab periods in the evening, and online coaches who work in a scientific industry. Others might teach a foreign language through the combination of in-class dialogue, web-based software, and online activities with students in other countries. Still others, like New Classrooms, use a combination of teacher-led instruction, student collaborative activities, software, virtual instructors, and a complex scheduling algorithm to enable each student to move through an individualized learning progression at his or her own pace. Importantly, model providers also do not need to be directly managing the school. While some providers (e.g. Charter Management Organizations) may chose to both design new models and directly manage schools, others providers may design models to work within existing schools and with faculty who remain on the district's payroll. But in either case, model providers would begin to share in the accountability for student outcomes at the school level. State or districts that currently adopt textbooks would instead certify a number of model providers who would then pair off with schools (on a mutual selection basis) to support the implementation and customization of their model in a particular subject area. Over time, as models begin to mature, states and districts would be able to analyze the academic impact of the model providers, rewarding those that are most successful and decertifying those that are not. 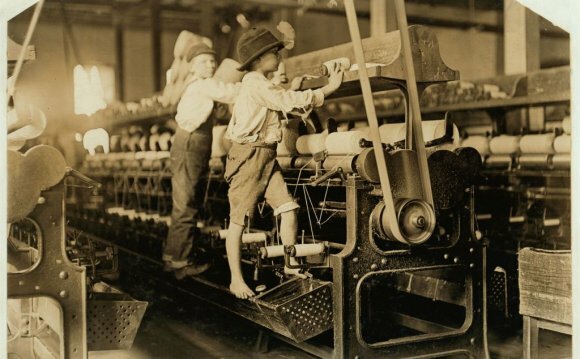 A cotton mill is a factory that houses spinning and weaving machinery. Typically built between 1775 and 1930, mills spun cotton which was an important product during the Industrial Revolution.